Volkswagen is certainly a name in the automotive world that a lot of car buyers have known to grow to trust. When you are looking for options in used Volkswagen cars for sale in Seattle, you will find that Carson Cars will always have an incredible selection that you can choose from.
. Each one of the vehicles that we have for sale on our lot have all been fully looked over by our professional team of technicians. This means that you will always have the peace of mind that you need as you shop. Whether you are looking to upgrade your current vehicle to a newer one and you have a vehicle that you will be trading in, or you need to add another vehicle to your current household, we will always be able to find you the lowest pricing on a dependable used VW car. All you have to do is make your way to see us at the dealership and our professional sales team will show you around to view all of the current selection for sale. 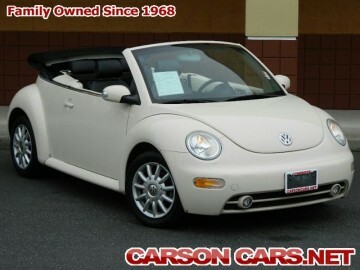 For used Volkswagen cars for sale in Seattle, call Carson Cars at (855)583-9356. We offer VW cars for sale and quality, affordable second hand VW cars and we look forward to making your dreams of buying a beautiful Volkswagen a reality. Stop by and see us today so that we can give you some insight on the pricing, customer service and overall reliability that our used car dealership has to offer.